The Motion Q is a comparable, affordable alternative to on-brand portable speakers. If you're going to be spending time by the pool this summer, this is the budget speaker to take with you. For a company that’s recognized for its portable power packs, Anker sure is making its mark in the audio world. While you’re not going to get hi-fi sound from the Anker Soundcore Motion Q, you are going to get a great compact speaker that’s ready for adventure or a leisurely dip in the pool. For $49.99, the Anker Soundcore Motion Q serves as a great budget, portable speaker. With the portable Bluetooth speaker market already over-saturated, is there a reason to go for the Motion Q over its lauded competitors? Hosts. If you’re hosting a small get together, the Anker Soundcore Motion Q is a great sub-$50 option. It emits 360° sound. No matter where your guests are seated, they’ll be able to hear the music. Outdoorsy folk. If you’re one for camping, hiking, or swimming, the IPX7-rated speaker is a great addition to your bag. Though the included strap—more aptly described as a shortened shoelace—leaves plenty to be desired, it serves as a means to an end, allowing you to hang it up or tie it around anything. How is the Anker Soundcore Motion Q built? For starters, it’s IPX7-certified, which means that it can be fully submerged up to a meter for a maximum of 30 minutes. 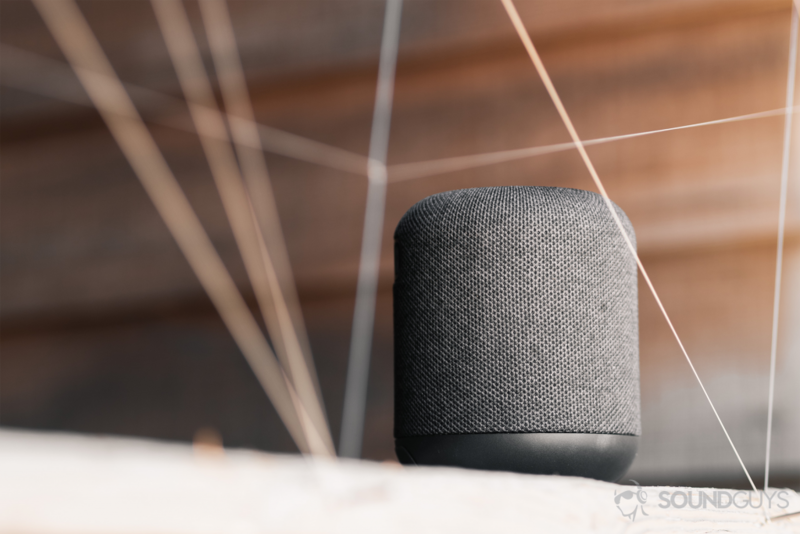 Though it lacks an official dust protection rating, the Motion Q benefits from a woven cloth wrapped around the speaker. This helps to keep debris out and makes it easier to grip. The cloth wrap dries quickly and makes it easy to grip the Anker Soundcore Motion Q. The Anker Soundcore Motion Q is about as small as a half-crushed can of soda, and can be packed into a bag without a second thought. Its cylindrical shape tapers into a completely flat base, which is prone to sliding around on most surfaces like linoleum and varnished wood. Rubberized feet would easily remedy this. Towards the bottom, a door reveals the 3.5mm aux and micro-USB inputs. Move just two inches north of the inputs, and you’ll find a hand strap mount for securing the included shoelace-not-shoelace. Contrary to the lace’s dubious durability, it’s actually quite useful—and can be used to fasten the Motion Q to nearly anything. Atop the speaker, the control panel is outfitted with four buttons that difficult to blindly differentiate. Fortunately, the control panel is self-explanatory. You can make volume adjustments, skip or reverse tracks, pair, and access a virtual assistant like Siri or Google. Though you can’t online shop like you can with an Alexa smart speaker, you can inquire about the weather and take calls with the built-in mic. You can take calls and access Siri or Google Assistant via the multi-function button, which also serves as the pause button. To pair with another Soundcore Motion Q for stereo playback, press and hold the power button for three seconds. A flashing white LED indicates that you’ve entered Anker’s True Wireless Stereo pairing mode, and a solid white LED indicates that the speakers are connected. Absolutely. For just under $50, you’re getting a raft of features, the main one being the Anker Soundcore Motion Q’s 360° sound. It’s rigged with two opposing drivers flanked by two passive radiators. Though it’s a compelling design, there is an audible difference between standing in front of driver as opposed to a passive radiator. That said, sound is more evenly distributed than with the Bose SoundLink Micro. Housed internally is a 2600mAh battery that allots 10 hours of playback. The aux input can also be found in the protected, recessed port. Anker’s Soundcore Motion Q operates on Bluetooth 4.2 and features a 20-meter connectivity range. The range is accurate when inside, but if you’re planning to use it as intended, get ready for intermittent interruptions a few times per song. Additionally the Motion Q doesn’t offer multiconnect and isn’t aptX-compatible. Naturally, video streaming suffers from audio-visual discordance. By depressing the power button for three seconds, you’re able to pair the Motion Q to another Bluetooth speaker for stereo sound. A countermeasure to these issues is to settle for auxiliary listening. Aside from the annoyance of physical tethering, this renders onboard controls null. With the aux input in use, you’ll have to make adjustments via the source device and party like it’s 2005. The dedicated mounting system makes it difficult to loop the aglet of the shoelace through. Cracking open the speaker means 1) you’re out $50 with just a broken speaker to show for it and 2) that you’ll find the 2600mAh source of the Motion Q’s 10-hour playback time. During testing, the speakers provided 11 hours of music with the volume at 50 percent—impressive considering that Anker lists the battery life at 10 hours. Where the speaker falls short is charge time. It takes 3.5 hours for a full charge cycle, making for a poor ratio. Keeping in mind that this is a budget waterproof speaker, it sounds quite good. To get the most out of the Motion Q, set the volume to at least 50 percent. Otherwise, everything sounds under-emphasized or—as was pointed out to me during testing—“like the music is coming from a laptop speaker.” Ouch. The Anker Soundcore Motion Q speaker is half the price of the Bose SoundLink Micro speaker. Both are IPX7-certified and are intended for on-the-go use. Turn it up and you’ll notice that the mids are exceptionally well reproduced for a speaker that boasts strong bass. In Janelle Monae’s song Take A Byte—set to the key of A—Monae’s monotone vocals stand out from the predictable drum hits throughout the verses. Midrange clarity improves during the chorus when Monae’s vocals transition into a dynamic harmony with the newfound arrangement of the G – F#m – A – E chord progression. Astoundingly, the midrange reproduction can compete with—though not surpass—the Bose SoundLink Micro, which is $50 more than the Motion Q. Not too shabby, Anker. As far as the treble goes, I’m impressed. The song’s recurring flat-hand claps are audible over the cacophony of instruments and synth-derived sounds. For solid reference, flat-hand claps produce a sound that “typically extends to about 10kHz” according to a report from the Australian National University. The included strap is just a shortened shoelace that may be prone to snags and tearing down the road. In order to account for lack of isolation, speakers may be treated to overemphasize treble frequencies like clapping. Manufactures do this at the risk of making the listening experience fatiguing, but Anker avoids this altogether. If anything, the treble could use a bit of a boost to match the artificial feigning of detail that our ears are used to. Unfortunately, the lows are the weak link. Perhaps it’s because my expectations were too high after seeing the inclusion of “BassUp” technology, but the bass is super weak. For instance, in Take A Byte, sub-bass is inaudible—unless you max out the volume. Now, that isn’t ideal because the speaker gets awfully loud. I recorded a max output at 94.1dBA and 88.4dBA from a one and two-foot distance, respectively. Even still, I found the SoundLink Micro’s low-end more enjoyable and less anemic. Alternating between the two speakers during Take A Byte was night and day with regards to bass reproduction. Due to its IPX7 rating, the Anker Soundcore Motion Q can be fully submerged up to 1m for a maximum duration of 30 minutes. Listening inside allows for better bass because there are fewer disruptive environmental noises like lawn mowers, construction, and what-have-you. What’s more, being inside means that you’re surrounded by walls that the speaker can use to reverberate sound. When you do take the Motion Q outdoors, it will sound much better with the volume turned up to 75 percent. If you’re on a tight budget or just want a speaker that you don’t have to worry about tossing into a bag or into the creek, then the Anker Soundcore Motion Q is for you. Sure, it’s not a smart speaker, but the Motion Q isn’t trying to be a smart speaker. It’s for those who lead an active lifestyle and don’t want or can’t afford brand-name products. Granted, the Motion Q doesn’t feel cheap by any means, and you’re getting an excellent value for $50. The Anker Soundcore Motion Q is perfect for intimate gatherings when all you want to do is set the speaker up and forget about it. If you’re already invested in either the Bose or JBL ecosystem, you’re likely going to stay there. Yet, if you’re just entering the world of portable speakers and don’t quite know what you fancy, the waterproof Anker Soundcore Motion Q is a great way to test the waters. Soundcore Motion Q The Outdoor Bluetooth Speaker with 360° Sound and Full Waterproof Protection. 360° Music Two full-range drivers located at the front and back are paired with two passive radiators on both sides to produce full-bodied 360° sound. Revel in your music, wherever you're standing. Optimized Bass Engineered with exclusive BassUp technology to ensure each hit of bass sounds more intense, more refined and crystal-clear. Feel each spine-tingling pulse everytime the beat drops. Complete Protection Motion Q's internal components are fully protected by an IPX7 waterproof casing. This waterproof barrier can withstand full immersion in up to 1 meter of water for 30 minutes. Invisible Link Pair two Motion Q together via Wireless Stereo Pairing for a huge hit of stereo sound*. Experience pumped up volume at parties or enjoy an elevated at-home movie experience. Grab and Go Motion Q goes with the flow—pick it up, hang from your wrist, or hook it on your bag or bike. The durable build and practical wrist strap let you take your music anywhere for instant atmosphere. Listen for Longer Anker's superior power management system and an efficient Li-ion battery ensure you'll get up to 10 hours of playtime from a single charge. What You Get Soundcore Motion Q, wrist strap, micro USB cable, our worry-free 18-month warranty, and friendly customer service. * Note: For optimal performance in Wireless Stereo Mode, position speakers within 16 ft (5 m) of each other indoors, or 48 ft (15 m) in open spaces.